After covering some more grim topics I thought we might do something lighter, in tone if not calorie content, today and talk a little about diners. 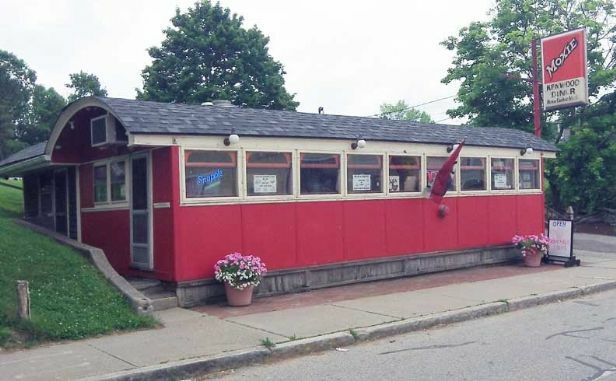 While diners can be found throughout the United States (and beyond) they had their genesis in New England and remain, despite decades of economic pressures and societal change, not uncommon throughout the region. They were much more common in the 1920s than they are today and served as a place where laborers and lower-level white collar workers – clerks, shop girls, etc – could find an affordable, informal meal outside of the home. The earliest version were little more than kitchens on wheels, with a counter for sales, and the food was expected to be taken away for consumption. An early lunch wagonWorcester and Providence both claim the title of “Home of the Diner” and many diners were manufactured in one of these two cities, but it was Providence that saw the first ‘diner’, when Walter Scott began selling hot food out of the side of a lunch cart in 1872. These ‘lunch wagon’ style diners began to be mass produced in the 1880s, designed to be carried to a new location by train and wagon, which helped to define their shape. The Kenwood Diner, in Spencer Mass., a barrel-style diner. Yes, that is a Moxie sign. By the turn of the 20th century stools were added to these lunch wagons so that a few customers could diner in relative comfort. Soon diner manufactures began offering larger diners (sometimes called ‘car’ or ‘barrel’ models) with small booths; the basic structure of the diner remained the same, a long barrel-roofed rectangle with a grill behind a counter one of the longer sides and booths across on the other long side, with a space to walk in between. Over time often the kitchen was expanded at the rear of the building, allowing for a greater range of food offerings. The cost of buying a diner was not nearly as significant as starting a restaurant or other business and many people looking purchased a diner and went into business, especially near large manufacturing plants or other places where working people congregated, like the business district of a town. Owners were frequently immigrants, Greeks especially in the period after the Great War, but the fare was very traditional New England. Cooking was often done on a grill or large flat griddle, so at breakfast eggs, pancakes, and bacon were standard and for lunch hot sandwiches (hamburgers especially) were typical, with soups (which could be kept warm a long time), steamed vegetables, and fried food as typical sides. Baked deserts were typically offered as well though ice cream became common once freezers were widespread. For drinks, coffee was the norm, but milk, tea, cold water, and bottled sodas (traditionally called ‘tonics’ in New England) were an option even when the place was too small for proper soda fountain. Those diner that offered dinner usually sold the sorts of meals that could be made in bulk and in advance – like stews, pork or beef roasts, and roasted chicken or turkey – or foods that could be cooked to order quickly, like steak and eggs. Customers were often times regulars who might dine at the same establishment every day, and so a short order cook or waitress could often recognize a guest on site and have their order ready without ever saying a word. At other times though, the diner offered anonymity, where one could dine alone if wanted, with minimal intrusion or interruption. The the classic era of Call of Cthulhu diners competed for customers with cafeterias and automats but these were much larger establishments and food was not prepared to order and the case of the latter, hot options were more limited. No relation to Charles Foster Kane, I’ve been told.The most common name for a diner would be the town or locality it was found, sometimes prefaced by the moniker “Miss” (to make it seem friendlier perhaps? ), hence the Agawam Diner, the Miss Worcester Diner, or the Moran Square Diner. Other times it might be named for the owner (Poirier’s Diner, Lou’s Diner). Other options were possible – the Blue Moon Diner, the Boulevard Diner. My personal favorite name for a diner, sadly long gone was Worcester’s Alice and the Hat diner, named for the husband and wife owners/operators, which served primarily employees from the Worcester Gazette. In the 1950s as automobiles began to replace public transportation or foot traffic, diners evolved and expanded. The companies that made the ‘car’ diners began offering larger prefab buildings that would be assembled on site rather than delivered whole – there are the large diners, often covered in chrome plating and with neon signs, that pop up in 1950s nostalgia products. With the rise of fast food and other dining options and as businesses either closed or move away from center cities, diners entered into a decline and by the 1970s many had closed. A combination of nostalgia and entrepreneurship has revived the diners in the past thirty years, at least somewhat, and those that are seen as emblematic of a community or have found new customers continue to operate more than century after their development. Canonically of the only one of the towns of Lovecraft Country with diners are Arkham and Kingsport; Dunwich and Innsmouth are too small (though the latter has a dingy restaurant). Aunt Lucy’s Diner (A134), with fried chicken, mashed potatoes, and “heavy white crockery”. Open 5 am through dinner, Mon-Sat. The Grafton Diner (A138), next to the train station and the only place to eat in Arkham that is open on Sundays. The food is not as good as Aunt Lucy’s. Open 5am through dinner, daily. Fleetwood Diner (A202), is a small – seven seats only – older style diner, with a working class clientele. Open 4am through lunch, Mon-Sat. Bee’s Diner (A210), known for hearty chowders and maple ices (during maple surgaring season in the spring). Open 6am through lunch, Mon-Sat. Graham’s Lunch Cart (a creation of my own for issue #3 of the Arkham Gazette). This horse-drawn cart – counter service, no seats – has been serving customers across from Christchurch Episcopal Church for more than 30 years; arrived every weekday at 4am and is driven away every afternoon at 2:30. Open 5 through lunch, weekdays only. There is also the Church Street Cafeteria (A440), which I note to show that Keith Herber actually did his research in writing Arkham Unveiled. Dennehy’s (K501) which “caters to the downtown lunch crowd” and offers simple fare. The White Pier Cafe (K407) on the shore is described as having a counter and few booths, so I suspect it is a diner. Popular with the artist colony. These were all assembled based on my research and the late, lamented Diner Finder website around 2009-10 and, considering the typical lifespan of a family run restaurant, I would assume that some of these have changed names, changed owners, or even been closed entirely. Before visiting any of these locations, make sure they are still there! Speaking of Diner Finder – it looks as if the much of the data remains on the old site (which seems to have been shuttered some time last year), but some database errors make the thing look quite ugly and the clickable maps are gone. Though increasingly dated, Randy Garbin’s Diners of New England is the best source in print for all of New England’s many surviving diners, at least as they existed ten years ago.